This page provides you with Chief Financial Officer resume samples that you can use for inspiration in writing your own resume, or for creating one through our easy-to-use resume builder. Below you'll find our how-to section that will guide you through each section of a Chief financial officer resume. You are the Chief Financial Officer of your company, or you aim to be it. You think you have all the skills to be the senior executive responsible for managing the financial actions of that company. You think you can easily assist the CEO with forecasting, cost–benefit analysis and obtaining funding for various initiatives. You think you deserve that highest-ranking position, but...you also believe your resume could be better. Don’t worry though, if you are looking for the best Chief Financial Officer resume sample, you have come to the right place. We have helped many professionals in your industry get to the next level and we want you to be next. Let us inspire you like we inspired 3 million people all over the world. How to Write a Chief Financial Officer Resume? Crafting a strong CFO resume is important. Let’s start from the format: there’s no doubt the gold medal here goes to the reverse-chronological layout: it presents your freshest wins up front. Friendly tones are far better than a simple fact-to-fact style as it can often be off-putting. What is more, you don’t want to add a funny undertone rather a serious but warm undertone instead. Absolutely Not. Clients receive more than 60 resumes on average for each project. This makes it extremely impossible for them to decide who to hire, so that’s why a good summary section on top of your resume helps them make a final decision. A perfect summary should be succinct and precise which means short and not vague. It is your pitch to your client: make it count! Use the words “best CFO” more than once. What should be added? Well, your recent work history for a start. What positions have you worked at recently and what sort of experience did that provide you? These things must be added simply because it’s showing a recruiter why they should pick you. What is more, the history of your employment could allow a recruiter to say for certainty you’ve got the experience to work as a CFO in their organization. Tell them what qualifies you as a CFO. If you need more tips on writing the best work experience section for a great CFO like you, check out our detailed resume guide. This is a very important section for a CFO’s resume as client’s are searching for specific skills that their hire must have to complete the job. The best way to know which skills to add here, would be to look in the job description itself and add those skills and related skills in your skill section. A cover letter is your chance to convince your future employer that you are the one. Follow our simple tips here. Ensure talents are listed along with your skills. Hobbies can be added to bolster your attraction to recruiters. Don’t attempt to be too funny. Don’t add skills not suited to the position of makeup artist. 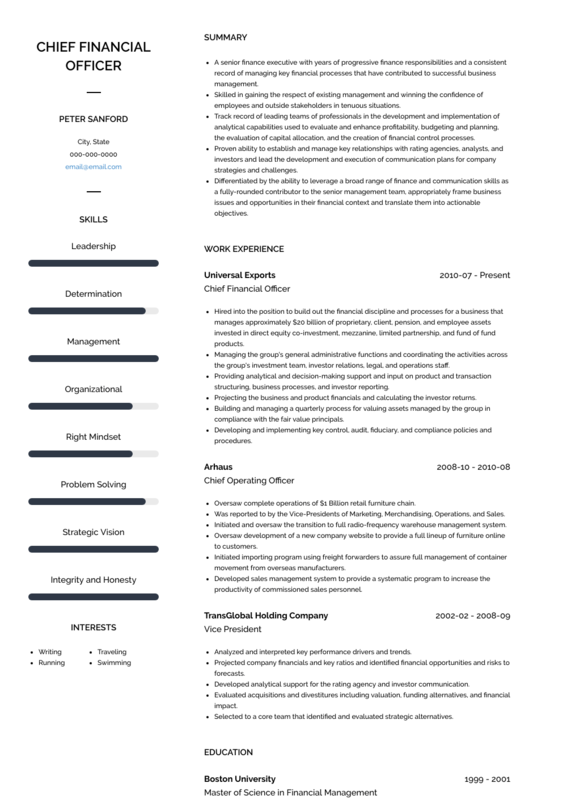 Thanks so much for your time: you now have access to standout CFO resume sample: if you are also looking for the best CFO resume templates, you should check these masterpieces we have been working on here : many professionals like you have successfully used it to take their career to the next level.